For a current undergraduate to carry out a project examining an aspect of your institutional practice, or exploration of a new initiative, with the goal of sharing with the ASET community. The student must be currently studying at your institution, which must also be a current member of ASET. For a current student or recent graduate to carry out a clearly defined piece of small scale research designed to grow the body of research into work-based and placement learning. The student must be currently studying at your institution, which must also be a current member of ASET. The ASET Bursaries 2019 has full details of the awards. All applications must be received via the 2019 ASET Bursary Application form and emailed to the ASET Office by 9am 1st March 2019. 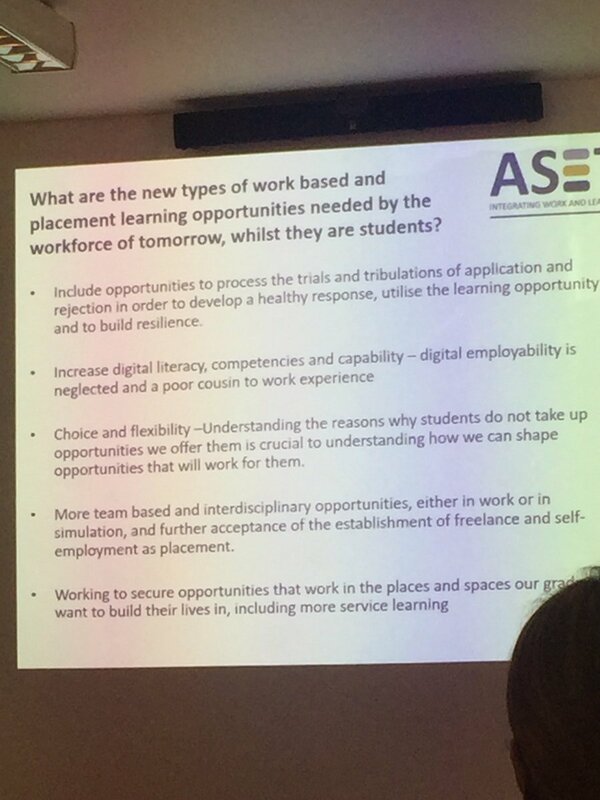 What determines student success and failure when searching and applying for placements? In 2015, we were delighted to once again be able to select two projects for funding. The first of these was awarded to Clare Fletcher, Placement and Projects Officer, at Teesside University. Clare’s project was undertaken by Teesside University undergraduate student, Josh Gallagher and supervised by Mark Handscomb, Programme Leader for BA Journalism. Josh presented his findings at the ASET Annual Conference 2015, at the University of Exeter (6th – 8th September 2015), along with a short film he created as part of his project. His presentation will be part of ASET Annual Conference Proceedings 2015, and his full report ‘Piloting student media placements in non-traditional media environments: Teesside University School of Art and Media and James Cook Hospital Communications Team‘ is available here. The second of these was awarded to Pat Cullum, School Co-ordinator for Student Experience, School of Music Humanities and Media, University of Huddersfield. Pat’s project was undertaken by University of Huddersfield undergraduate student, Matthew Lightfoot . Matthew presented his findings at the ASET Annual Conference 2015, at the University of Exeter (6th – 8th September 2015). His presentation will be part of ASET Annual Conference Proceedings 2015, and his full report ‘Support for Students with Mental Health issues on Placement‘ is available here. For 2014, in addition to the ASET Research Student Bursary another bursary was launched. The Exploration and Enhancement Student Bursary invited proposals to fund an undergraduate or recent graduate to carry out a small project “investigating an aspect of your institutional practice related to placement or work based learning”. This second bursary was developed for two reasons; to provide a funded student placement opportunity; and to facilitate the sharing of innovative practice in placement and work based learning. We were therefore delighted to be able to select two projects for funding in the inaugural year. Work Placements in Safety Critical Industries: A Built Environment Case Study– Final Report. The first bursary was awarded to Helene Turley at the University of Wolverhampton for her research into “The Pros and Cons of a Central Placement Unit” which was undertaken by Ms Olabimpe Foluso, who presented her findings at conference in September 2012 and subsequently the University of Wolverhampton moved to a Centralised Placement Unit.